Sing Happy Birthday to Miami! 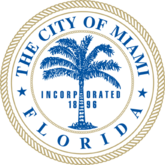 Presented jointly by the City of Miami and DowntownMiami.com since 2010, Happy Birthday Miami is an annual celebration honoring our history. This is a tradition that we can all be proud of, a joyous occasion with 100% of proceeds benefitting local programming. This year our goal is to fund Bike Miami Days 2012 featuring a monthly Bike Miami Day from January – April 2012. Posted in Promote Bike Miami Days!